As a Southeast Asia nomad for the better part of two decades, Vietnam has always been one of my very favorite places to photograph. On the surface it’s easy to see why – the spectacular, seemingly endless mountain rice terraces of the northwest; 54 colorful tribal/ethnic groups, most of whom still live traditional lifestyles; the fabled karst limestone formations of Ha Long and Bai Tu Long Bays; The Imperial City of Hue and several other World Heritage sites; the French colonial, “Indochine” streets of Hanoi and Saigon; 2,000 miles of gorgeous coastline; the legendary Mekong Delta, and so much more. Travel in Vietnam can be a bit difficult to manage for the uninitiated, as English is not widely or well spoken. Add to this the ancient Viet propensity to hustle wide-eyed foreigners, and you have a recipe for episodes of frustration if you are not prepared. But for the serious photographer who generally fares much better with a good guide or fixer anyway, such difficulties virtually vanish as the lead blocking is done for you. The hucksterism thus avoided, along with most of the main tourist zones, and you quickly find the Vietnamese to be quite friendly, welcoming, and genuinely pleased you have come to visit. Engaging with the people is definitely one of the great joys of travel photography in Vietnam. I have been spoiled in that my job as a director for a travel company that conducts photo tour workshops in Vietnam, has allowed me a lot of great access. This has been true not only for locations, but for having the opportunity to shoot with some top flight photographers as well. Included among them are Vietnam’s Nguyen Vu Phuoc, French resident, Rehahn, and frequent visitor these days, Australian David Lazar. I had the distinct pleasure of photographing with all three of them at various places last September. A selection of images from each, including several from that trip, are featured below. More images and information are available here. Nguyen Vu Phuoc, “Phuoc”, is a man of inestimable energy. He needs it, running three businesses in Saigon – a graphic arts company, a photography business, and a piano café! He began serious photography in 1993 and is now one of Vietnam’s preeminent photographers. 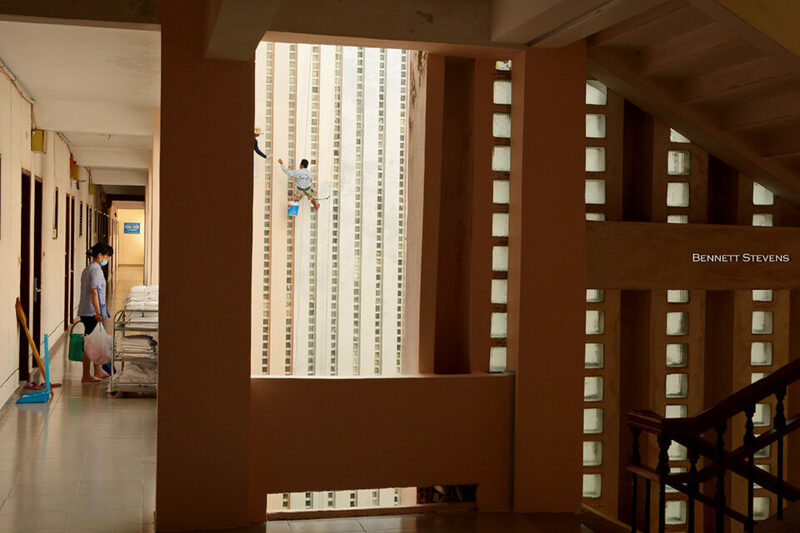 Highly skilled in multiple styles, from fine art to travel to documentary, Phuoc’s engaging personality, vast network of contacts north to south, and compositional creativity are all keys to his success. He travels with a Nikon D4s, D3s, Nikkor 24-70mm f/2.8G, 70-200mm f/2.8G VR, 14-24mm f/2.8G, Fish Eye 16mm, & a GoPro Hero. “Dragon Lady” was taken very recently in the ancient Imperial City of Hue. It’s a humorous look at the slang term for a domineering or powerful woman that originated in Vietnam long ago. 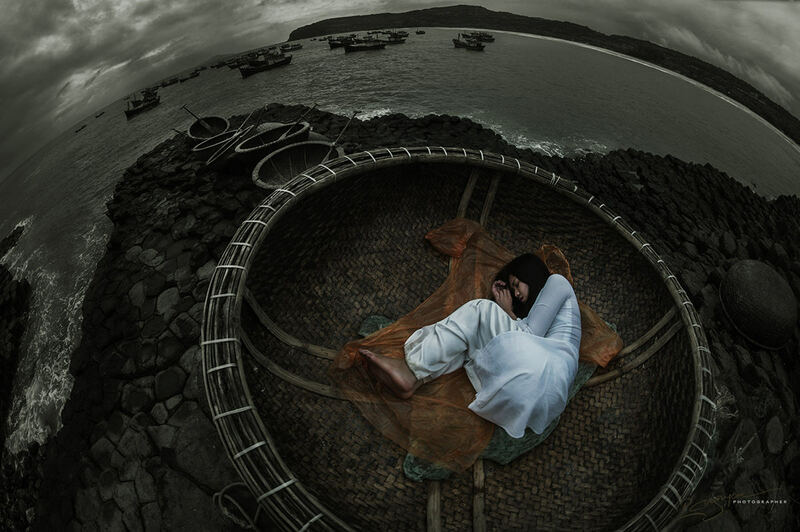 “Circle of Dreams” – A young woman naps in a round boat woven from bamboo on Vietnam’s central coast, near Phu Yen. The locals say the round shape allows for easy maneuverability when fishing in shallow coastal waters. 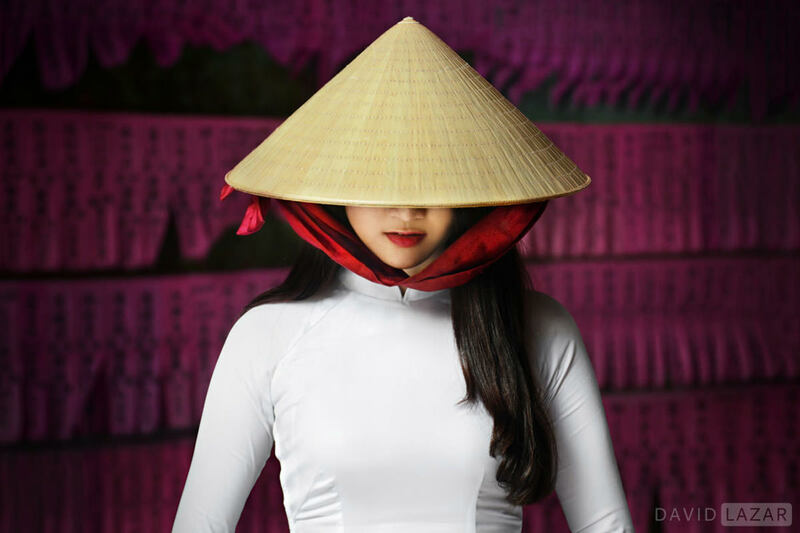 “Quintessential II” depicts a young woman in Ha Long wearing the traditional Vietnamese Ao Dai. White Ao Dai are often worn as school uniforms, and on formal occasions other colors are worn as well. Her hat is called a “non la”. 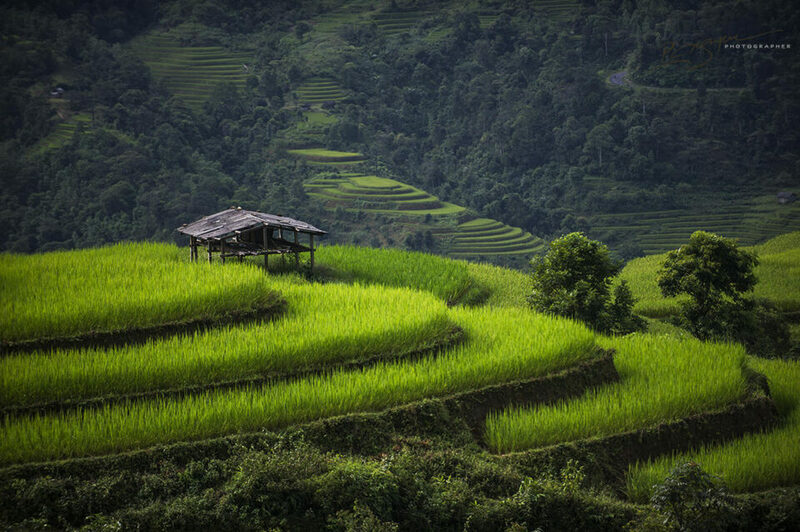 “A Room with a View” – The endless rice terraces of Hoang Su Phi are hailed by many as the most beautiful in Vietnam. The best times to photograph them are June (planting season) and September (harvest season). 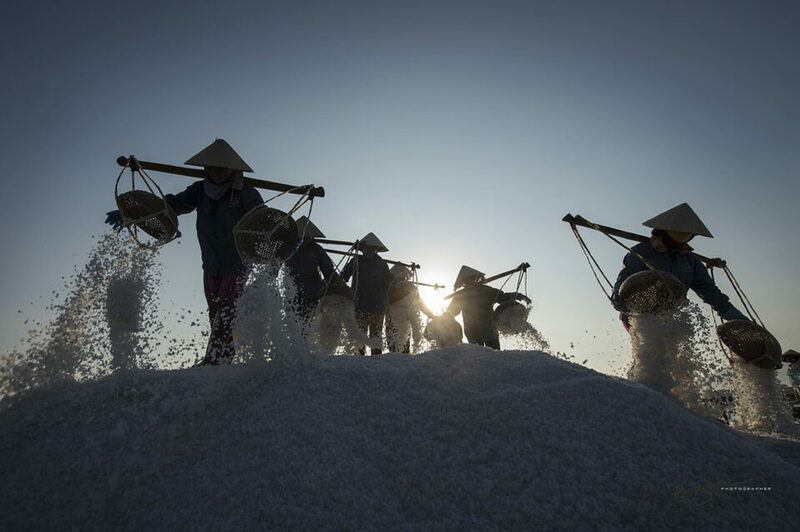 “Salt Dunes” – The salt harvesters of Khanh Hoa province first scrape salt from the bottom of shallow pools into cone shaped piles to be scooped into baskets and poured into large mounds, as shown. The salt is later shoveled into dump-trucks and taken for packaging. 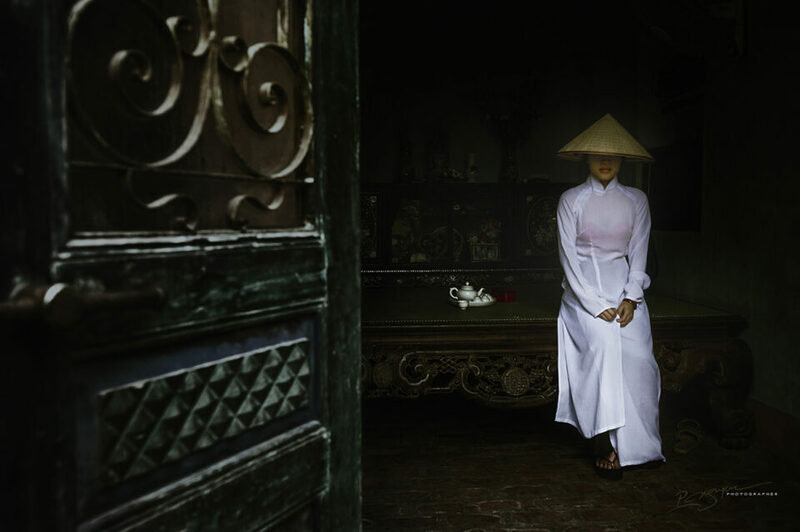 French born photographer Rehahn has in recent years made Vietnam his home. 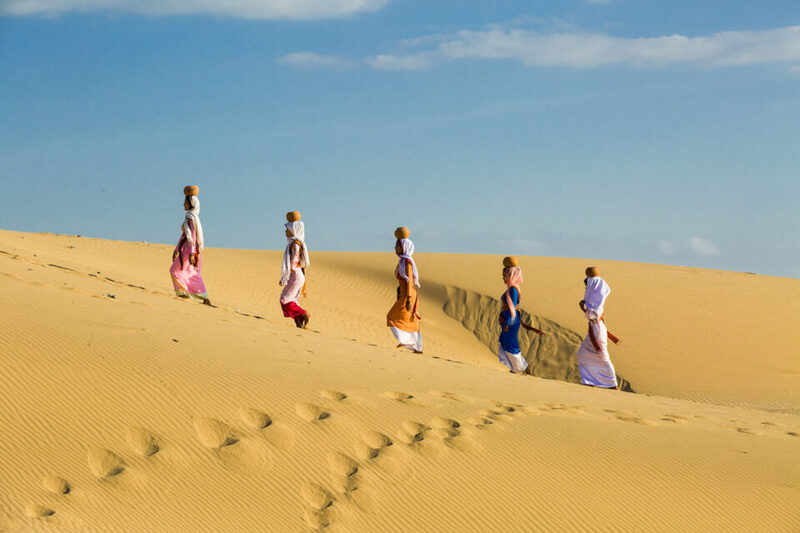 He has used his relocation to great advantage, not only learning the language and becoming very involved with the people and culture of Hoi An, (where he resides), but also in producing a tremendous volume of rare ethnic images from remote parts of the country. He’s produced 2 coffee table books in just a few years, and has appeared in many dozens of publications, including National Geographic and the cover of Conde Nast Traveler. Rehahn is an avowed portraitist who keeps things simple – natural light only and limited processing. He carries a Canon 5D Mark III and two Canon lenses – an 85mm f/1.8 and a 70-200 f/2.8 IS. 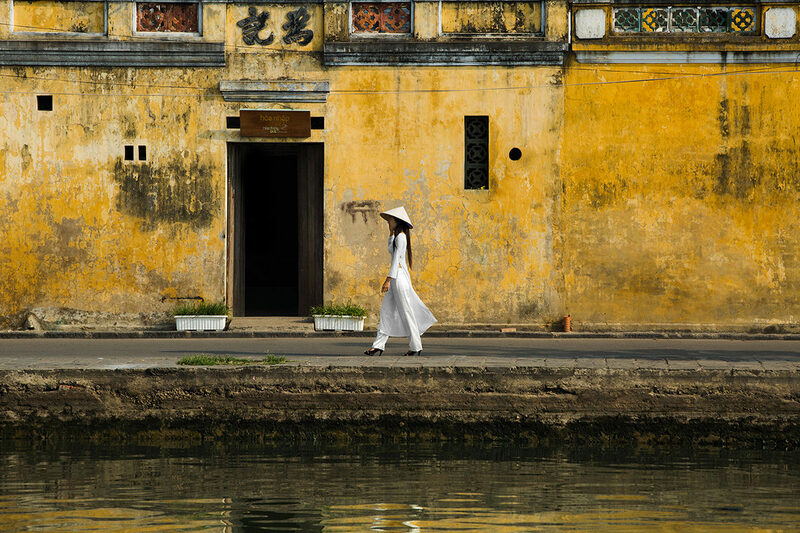 “Ao Dai Walking” – A young woman walks the waterfront at the UNESCO World Heritage site of old Hoi An. 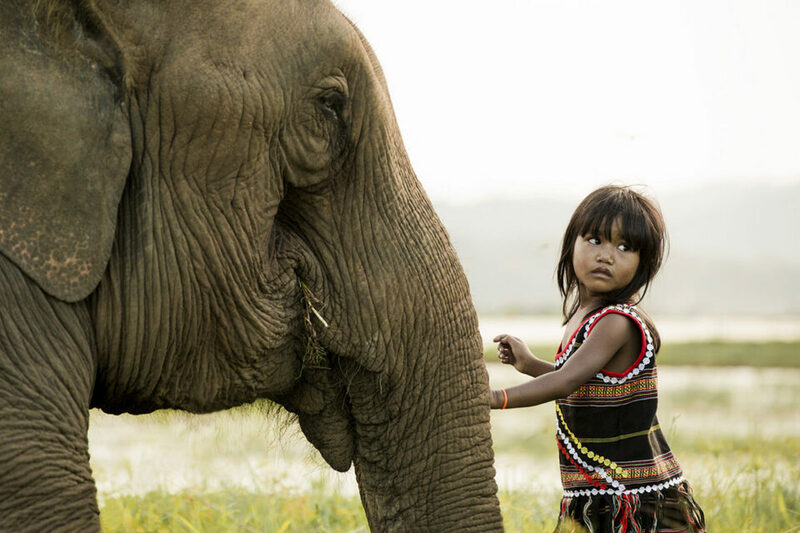 “The Girl & the Elephant” – This image of a little M’nong girl was taken in Dak Lak Province, in the Central Highlands. It’s from the same series as the photo chosen for the cover of Conde’ Nast Traveler. “Cornrows” – Low angle of a corn farmer with his crop drying above. Corn is distant secondary staple to rice, and is often planted in rocky ground where rice cannot grow. “Dune Walk” – Cham women walking across the sand dunes near Phan Rang, on the south-central coast. The Champa Empire ruled vast areas of coastal and central Vietnam between the 1st and 14th centuries, including the busiest trading port on the South China Sea, at Hoi An. Today they are a vanishing people with a unique, largely Hindu culture. “Mekong Maze” – The Mekong Delta is a vast maze of waterways in Vietnam’s southern-most coastal region. 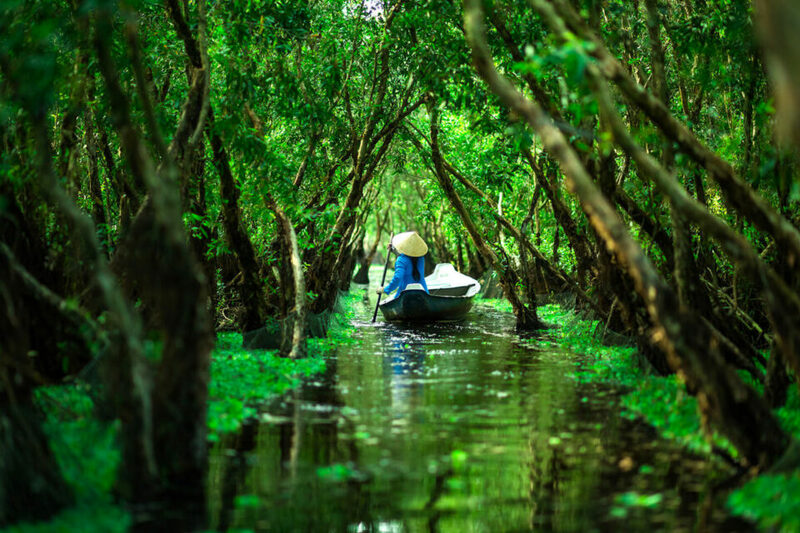 This image of a lady paddling a small sampan through a tunnel of Cajaput trees, was taken in the Tra Su wetland forest near the Cambodian border. Bennett Stevens, a.k.a. 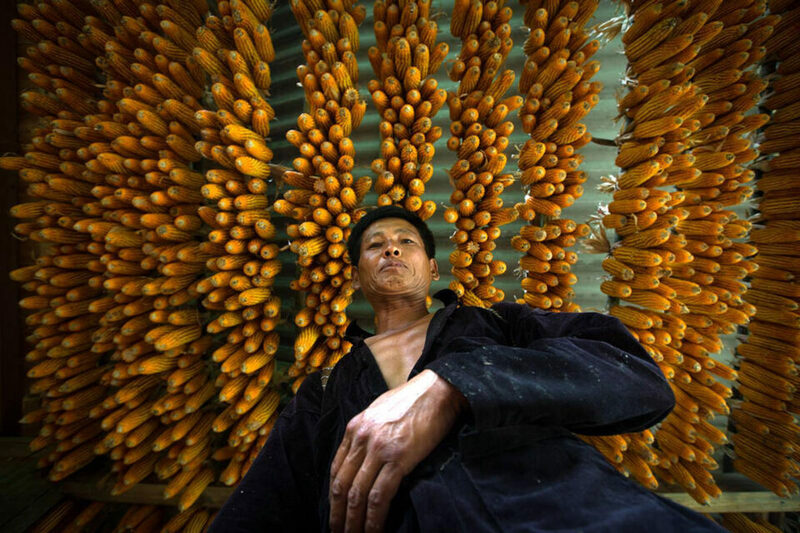 yours truly, is an award winning, semi-retired documentary photographer based out of Bangkok, Thailand. As an old school geezer he travels and shoots like one. A beat up denim shoulder bag conceals a beat up Nikon D200, D7100 and two lenses – a Sigma 17-50mm f/2.8, and Nikkor 70-200mm f/4G VR. No tripod. His main focus these days is tribal peoples and Southeast Asian cultures, and he loves the challenges of the street. 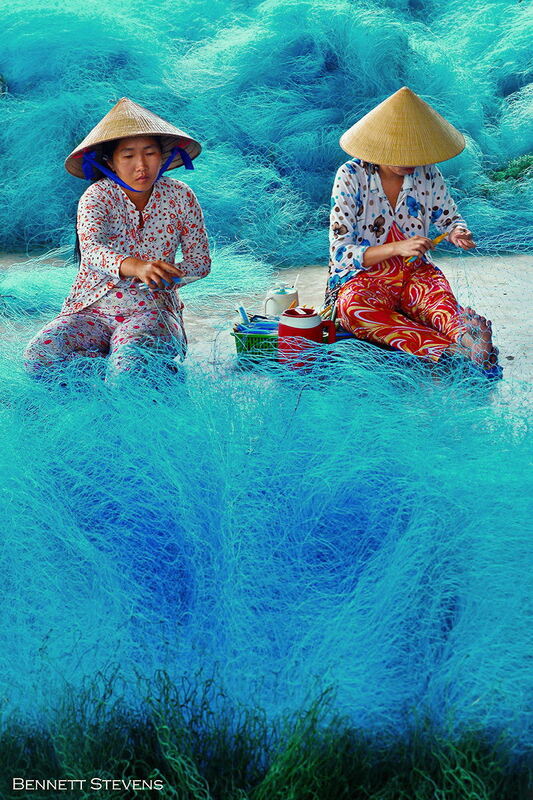 “Fish Net Blues” – Sewing fishing nets at a small factory in the Mekong Delta, Bac Lieu Province. 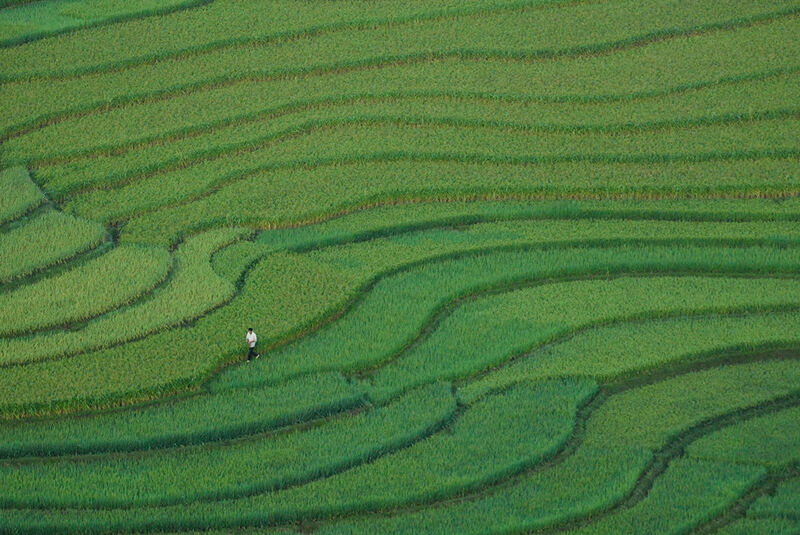 “White on Rice” – The owner of these terraced rice fields at the head of the Khau Pha Pass, inspects his investment. “Hey Bartender!” – A man painting a hotel in Tay Ninh is handed a lunch time cup of beer. 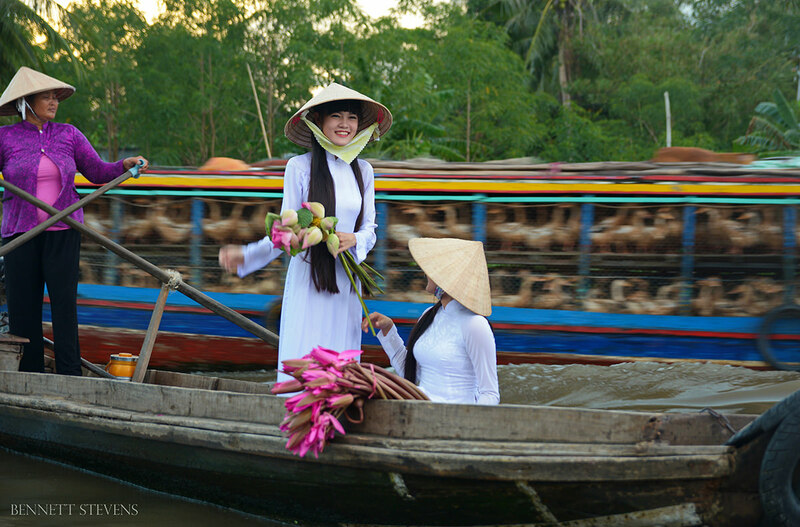 “Duck Boat Passing” – High School girls in uniform cross one of the myriad waterways of the Mekong Delta as a boatload of ducks goes to market. 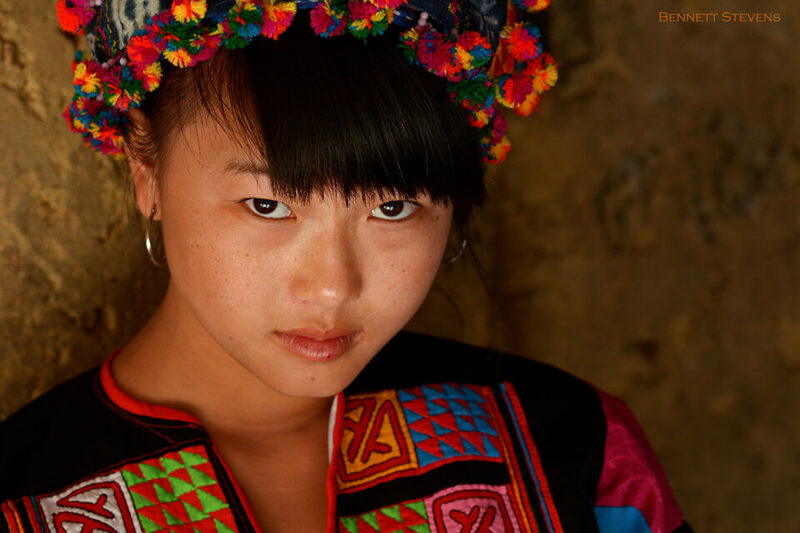 “Lo Lo Girl” – The Lo Lo are among the rarest of the northern mountain tribal groups. National Geographic contributor and multi major award winning photographer David Lazar, is another widely published “minimalist” photographer. He carries a Nikon D800, a Nikkor 24-85mm, and on occasion, a Manfrotto tripod. David considers himself a “fine art travel photographer”, with portraiture being his primary focus. He is very particular about light, prefers soft and even over directional, and won’t shoot if he doesn’t like the overall conditions. Like all good portraitists, David has an uncanny ability to make his subjects feel comfortable in front of the camera, which is no easy feat in foreign lands where the subjects rarely speak English. 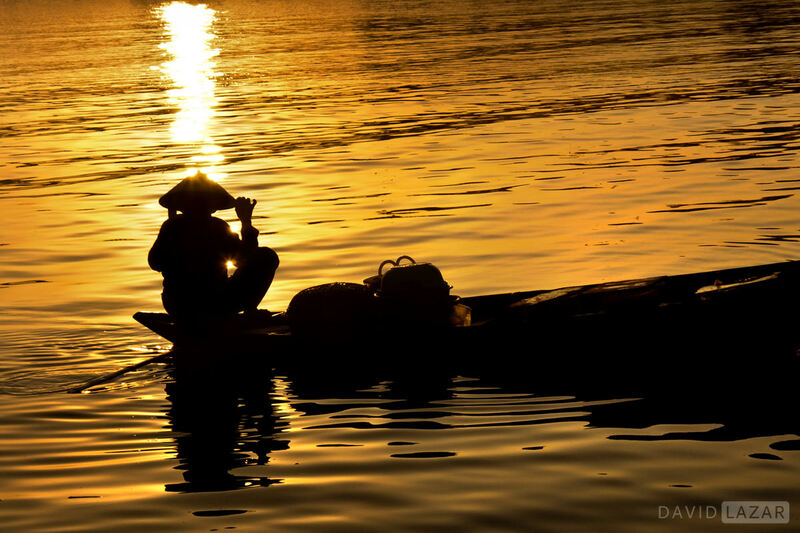 “Sunrise River” – Hoi An. 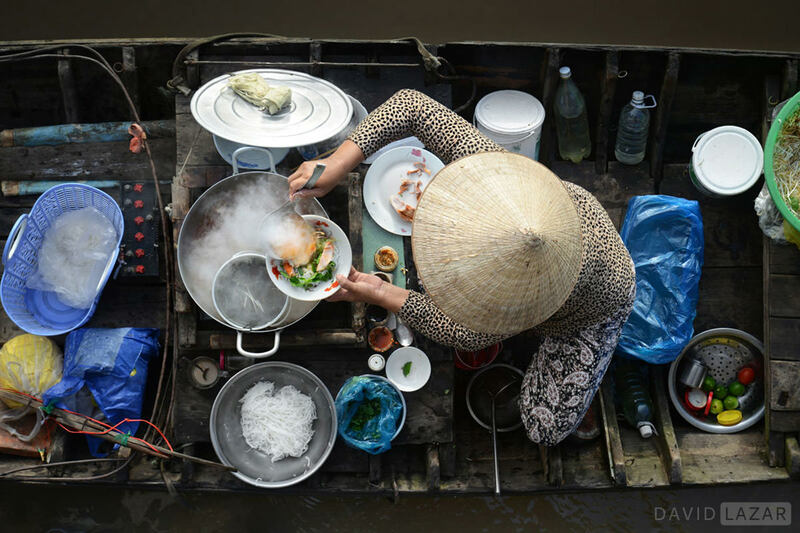 “Mekong Breakfast” – Breakfast is made and served from a sampan at Phong Dien floating market in the Mekong Delta. 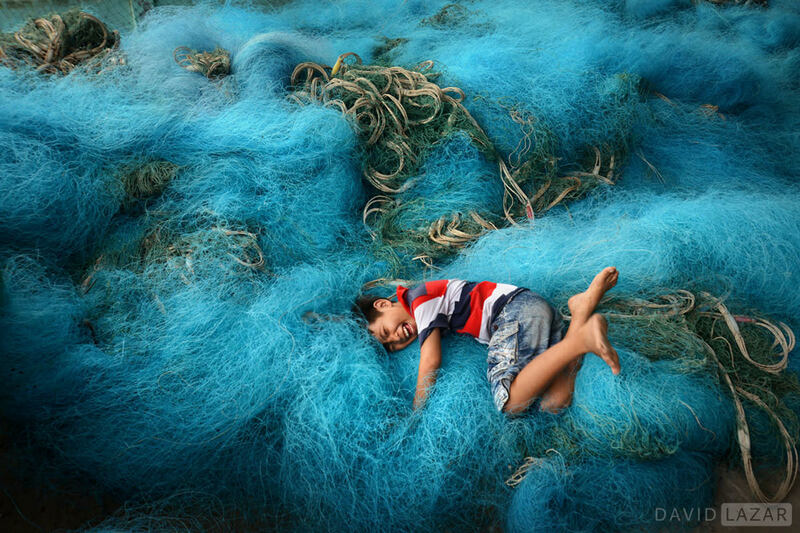 “Son of a Fisherman” – A boy catches himself after diving onto a fishing net in the Mekong Delta. 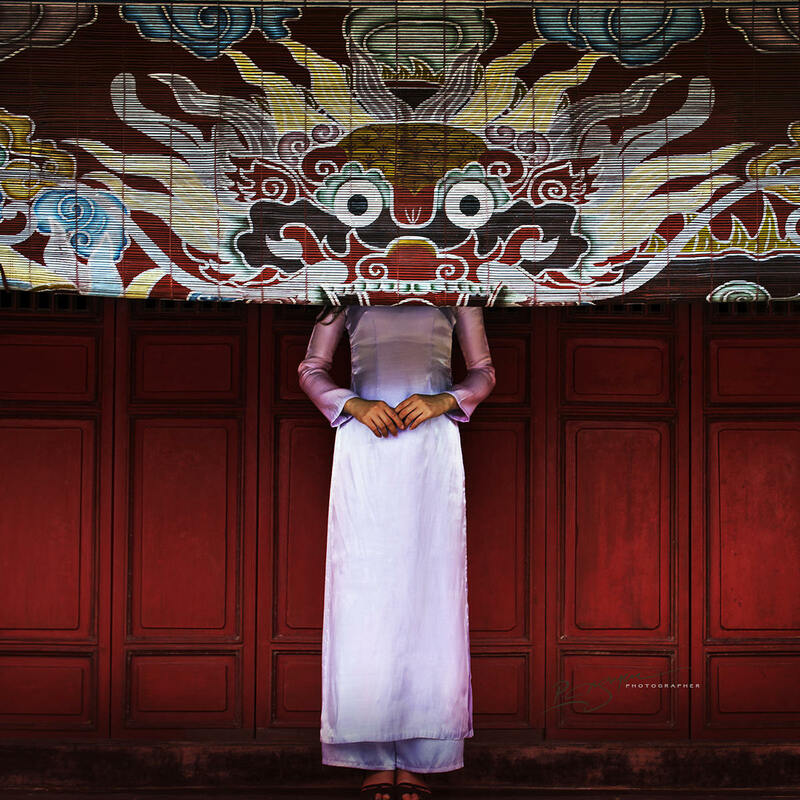 “Girl in Chinese Temple” – Classic image of a girl wearing a white Ao Dai and averting her gaze under a non la. The image was captured in Saigon’s Chinatown. “Framed” – Taken outside a Chinese temple in the Cholon area of Saigon. These pictures are beautiful and very well done. Makes you want to visit! Thanks for sharing. Very nice story and images. Always love these. These sets were gorgeous, thank you for sharing ! Wow! What a stunning, inspirational set if images. Superb. Very beautiful photographs. My wife and I spent 3+ months traveling by backpack throughout Vietnam in 2014. My have travelled pretty extensively throughout Asia (presently writing this in Georgetown, Malaysia) and we didn’t have huge expectations for Vietnam. We were extremely pleasantly surprised. We found a very friendly and welcoming nation who often went out of their way for us. There are still vestiges of the Vietnam War in military reflects strewn throughout Vietnam and several museums dedicated to the Vietnam experience in the war. I agree that the county and people are very photogenic. Everywhere we turned we saw something extraordinary or beautiful. As we were backpacking I was not carrying my DSLR but just a small Canon point and shoot but still managed many memorable photographs. Not usually the quality I see on your photos but still many I enjoy. You photos bring back many pleasant memories. Thanks again. I think the most inspiring thing to me is how relatively little gear these people carry. Maybe with the exception of the first photographer, the others keep it pretty simple and still manage to take stunning photographs. Really interesting stuff. Thanks. These images are absolutely stunning! Thank you for these beautiful images and insight into the photographers. I can see the possibility of an article for each photographer covering their vision, techniques and how they plan and execute their final output. Thanks very much for the nice comment, Mark – excellent idea! Thanks for the inpiration. Next week leaving for phototrip to Lombok, Flores and Kommodo (Indonesia). Maybe an idea to write an article with practical about taking photographs in tropical countries? I have done it may times and there are many things in terms of preparation and equipment that are really different. Weight, heat, humidity, light etc.. Very nice contribution! Amazing pictures and very interesting article! Very nice article and photographs! There are some really great images here; I do like the discipline of David Lazar, just shooting with one lens! By chance we are going in 6 weeks time, however, will be a family, rather than photographic trip. Mrs G has said that she will be my minder and model! Having sold my Nikon gear last year I will be taking my Olympus EM1, with Voigtlander 17.5mm , Oly 12-40mm and perhaps 40-150mm plus tripod.